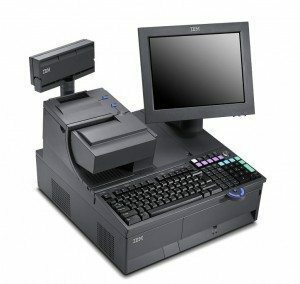 The IBM 4820 Model 4GT is a 12-inch Iron Gray touch screen display that attaches to the IBM SurePOS 700 Models 72x, 74x, 78x, the IBM SurePOS 300 Series (and other select systems) via the industry-standard 15-pin VGA-style analog video and powered or standard USB ports. It has a Capacitive Touch screen for manual input as well as additional I/O capability. It is available in two versions — a value version that supports the touch screen or a performance version that also includes support for the Iron Gray Magnetic Stripe Reader (MSR), Iron Gray keypad/MSR (available only as an RPQ) and keylock and is supported in a 4690 OS environment. In addition, the performance version includes 2 standard USB connectors for connecting other external USB devices. The highly convenient optional Magnetic Stripe Reader easily snaps onto the display. An optional 32-key, programmable keypad offers familiar key-entry of data and it also includes an integrated magnetic stripe reader. These I/O devices attach to the system units via USB connections.